Is the 27-inch iMac all it's cracked up to be? The quad-core iMac may among the fastest Mac models. But the 27-inch all-in-one desktop might be at risk for a feature that Mac users will not find as impressive—a cracked display. On Monday, I received an e-mail from a reader informing me that his 27-inch i7-based iMac had arrived with a cracked screen. He sent along a photo of the damaged iMac and asked whether I’d seen this before. The answer is yes—I saw the problem for myself last week in the Macworld Lab. The Core i7 27-inch iMac we used in benchmark testing arrived in our offices earlier this month with a cracked monitor. This iMac was a loaner from Apple, which routinely checks out these types of systems before shipping them to the press. So I’m confident that the damage to the screen occurred when the iMac was shipped from Cupertino to our San Francisco office. A replacement unit arrived via courier with no damage. 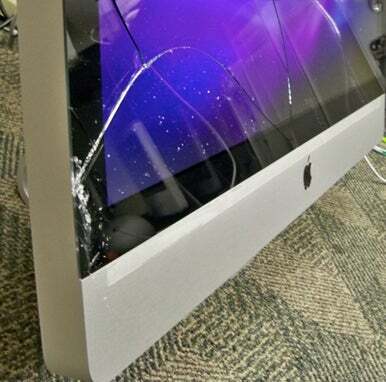 I chalked up Macworld’s experience to an isolated incident; however, reports are beginning to surface on the Web in which disappointed customers complain of receiving cracked-screen iMacs. Though none of the 93 comments in our i5 iMac review mentions any problems with cracked screens, Apple’s own support discussion boards are abuzz with nine pages of posts about cracked iMac screens. A second screen issue that’s also widely reported involves screen flickering, tearing (in which the image on the screen looks like a sheet of torn or ripped paper), and shutoff problems with the 27-inch iMac. A thread on Apple’s support site has 785 replies that fill 53 pages. We have not seen this problem on the iMacs we’ve tested, but we’ll keep our eyes peeled. Have you had problems with your 27-inch iMac? Let us know in the comments below.